Image of The Great Fire of London 1666 (Medusa Games, 2010) from BoardGameGeek. It’s easy to underplay the “board” part of a board game as merely serving as the boundaries of a game rather than as a fundamental part of a game's design. Ah, the joy of a physical tabletop game. I could probably tell you the quality of a game based on the sound it makes when shaking the box. 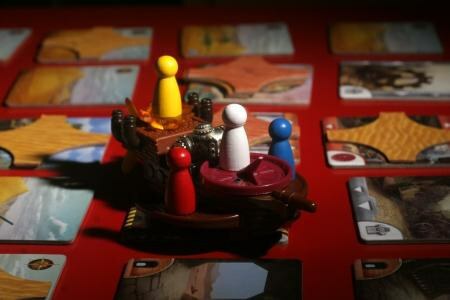 Many tabletop game reviewers devote sections of their reviews to discussing tangible components of play and for good reason. The physicality of board games is crucial to upholding a thematic play experience. Compare the feeling of a weighty copper coin versus, say, the flimsy paper money that plagues Monopoly. The thickness of cardboard can make all the difference when measuring the care a designer puts into their game. The physicality of material is crucial, but above and beyond quality in terms of importance to enjoying a game is the use of physical components in complimenting and defining the aesthetics of play. Despite the fact that all board games have physical components by definition, it’s easy to forget how minute decisions about physical designs improve play. Take The Great Fire of London 1666 for example. Designed by Richard Denning, the game simulates the titular conflagration that razed huge swathes of London in the 17th century, destroying some 13,000 homes. Setting aside the cone-shaped wooden fire markers (delightfully solid by the way), the map design by artist Andreas Resch is gorgeous and instrumental to the aesthetic of Great Fire. Yes, the board itself is drawn as though it’s an old-timey wood print, lovingly reflecting the time period depicted in the game, but more importantly, the game's spaces are tiny. See, The Great Fire has a relatively huge amount of little pieces that dot the board. The game represents fire with large cones, firefighters with smaller cones, and a plethora of colored houses that represent the homes that were at risk during the blaze. All of these pieces live on the board, crowding into the miniature neighborhoods. Even the arrows that determine the directional spread of the fire are squeezed into the thin alleyways between the buildings. It’s not an easily readable board, contrary to what we should expect from a play space, but it works wonderfully. The haphazardly constructed and close-quarters city that was made so vulnerable to rapid conflagration is realized in the physical space of the game. When playing, you and your friends will lean over the city, moving pieces around, searching for the parts of the town you want to protect, plotting your maneuvers in a physically comical way to move the fire towards others' properties, leaving a swath of destruction in its path. The Great Fire undermines a basic design principle in order to use its physicality to the utmost effect. The “war game” A Distant Plain, designed by Volko Ruhnke and Brain Train, also offers an example of a simple design decision that could effect play. 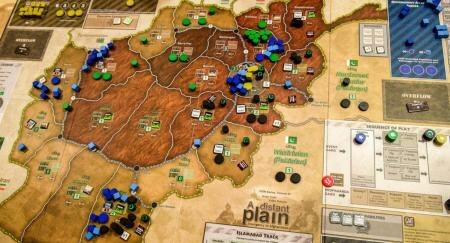 Part of the COIN series of board games, A Distant Plain attempts to model the complex struggles between various factions in Afghanistan during Coalition occupation. Four players take on the role of Afghani Warlords, Afghani Government forces, Coalition forces, and the Taliban. In this case, even the colors could convey interesting rhetoric: the khaki of foreign army fatigues, the green of warlord controlled opium fields, regal blue for the Government, and… well, Taliban black, which calls into mind pure evil or, perhaps, the black of the burqa in the popular consciousness. Likewise, the positioning of the factions around the board creates its own rhetoric. The Taliban forces sit directly across from and opposite to the Coalition forces -- the foreign influence that counterbalances the three. The warlords player sits next to the Coalition and the Taliban, benefiting from the destabilizing influence of them both and directly opposite to the Government, who seeks to limit the chaos that fuels the warlord economy. Something as simple as faction color and placement around a board can effect the preconceived notions of the conflict that we bring to the table and that influence our play. In the case of my play experience as the Taliban, I found myself ignoring the rising power of the warlords, seeing them as my ally despite our conflicting interests. One of my favorite examples of physicality conscious game design comes from designer Matt Leacock, the creator of Pandemic. While his global disease fighting game is my personal favorite, his two other games include fascinating board states that shift and turn -- literally. Published last year, Forbidden Desert is the spiritual successor, a sequel of sorts, to Forbidden Island. Both co-op games task players with acquiring four artifacts or mechanical pieces and escape the island/desert before they succumb to environmental hazards. In each game, a deck of cards causes the board state to change out from under the players, such transformations picking up and eventually reaching a frantic pace as the game goes on. Success means building 'Forbidden Island's getaway vehicle. Few board games create a distrust in the board state as well as these two Forbidden games. The titular island of Forbidden Island, composed of individual tile pieces, begins to flood and collapse entirely, shrinking the island play space as players scramble to reach a helipad with artifacts in tow. Meanwhile, the desert of Forbidden Desert swirls with sand storms and shifts the tiles around, moving precious watering holes across the map and burying life-saving tunnels under mounds and mounds of sand. The satisfaction of jetpacking over an enormous dune to bring a dying teammate your last supply of water is thrilling in large part due to the aesthetic power of both the shifting sands and the shifting landscape. One of my favorite board games as a kid was Mouse Trap, not because of the challenge of the game but because of the Rube Goldberg device that players constructed through play. With an attentive eye on the design of a game’s physical components, designers can fine tune play experiences in unexpected ways. 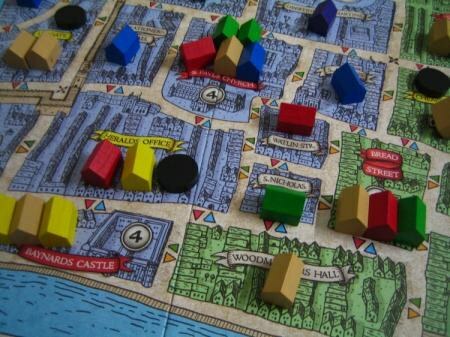 It’s easy to underplay the “board” part of a board game as merely serving as the boundaries of a game rather than as a fundamental part of a game's design. From theme to rhetoric, there is plenty of room in the game design box for cardboard cutouts, tokens, and little wooden pieces of art.